Today is Friday the 13th, the lucky day for one of the four following videos. A while ago one of the blog readers suggested a book trailer contest for Imaginative Realism. You are the judges! Please watch all four videos (they're only a minute long) and vote for your favorite in the poll at left. The videos are presented in the order I received them. It's OK to vote for more than one video. Poll closes Sunday morning. "Imaginative Realism" by Room 9 Studios, Chana High School. "It Begins With a Thought" by The Futuristic Flamingo. 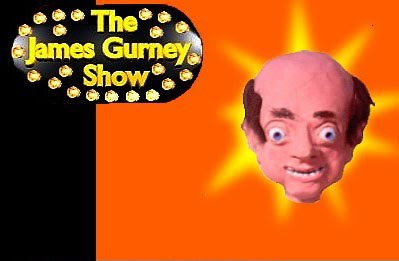 "The James Gurney Show" By GooGoo Supreme (Click Here to see flash animation). Note to contestants: Since there's a small number of entries, we can improve the prizes that I announced in the contest rules. 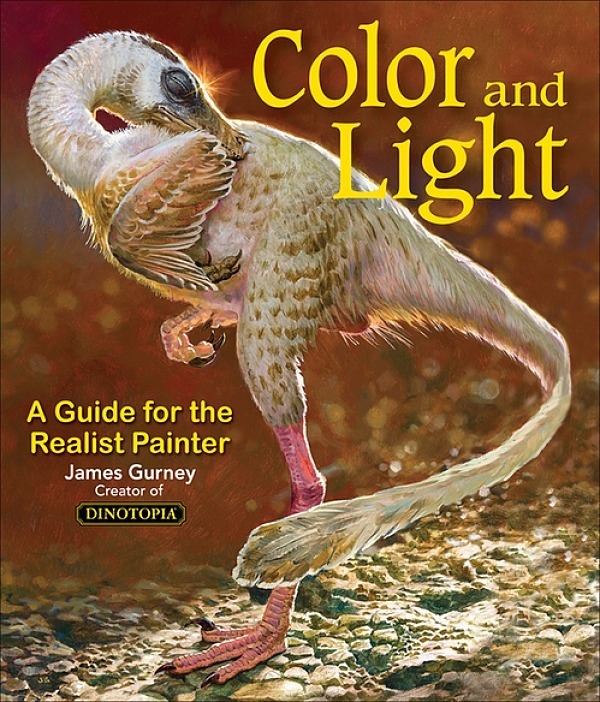 Each contest entrant will get to choose one favorite signed and remarqued book, DVD, or audio from the selection in The Dinotopia Store, as well as an Imaginative Realism poster. The Grand Prize Winner will get the choice of two books from the Store selection. Thank you all for entering and working so hard! I'm glad I'm not the judge. I'd never be able to decide! The votes are in! Thanks for all who voted, and thanks to the four contestants for creating those incredible videos. Emmanuel Laverde, you were the winner with 113 votes, followed the Futuristic Flamingo with 94, Room 9 Studios with 59, and GooGoo Supreme with 27. 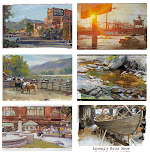 Would all four contestants please email me at jgurneyart (at) yahoo (dot) com? Please let me know your choice of book, DVD, or CD set, along with your mailing address. Mr. Laverde, please choose two items. Congratulations to all. all the videos were great, but there can only be one greatest....muhahaha! VEry good work guy's!!! you are very tried! Room 9 and the futuristic flamingo get my votes! Emmanuel Laverde gets my vote. "It Begins With a Thought" by The Futuristic Flamingo gets my vote. Aww such cool stuff to be found here! I can't believe someone could pull off all that stop motion in such a short time! Holy cow! I'm going to try to break out of my shell more often and not lurk as much. "If You Can See, You Can Imagine Too"
Being completely in the spirit of Mr. Gurney liking a bit of public attention but not taking himself too seriously (tron goggles, unicycle painter, publishing hilarious poses for paintings), I liked the Gurney Show best. (don't forget to hover over the book at the end: you'll hear a special message from Mars). But the Golden Idea here was adding the Statler and Waldorf parakeet. But that's just a very personal choice. More objectively, I have to say they are all extremely well made. I liked both the Da Vinci-entrance as the JG-show. As I had to laugh out loud with the last one, it got my vote. It begins with a though! Speaking of videos, where's the Unicycle Painter? It doesn't come up on my computer. Is it me? GooGoo got my vote, but they were ALL great! I agree with everyone: They're all great for different reasons. I vote for the first one... but then I'm a softie for stop action. so if i read this correctly, the person with the least votes wins, right, yeah!! come on no votes!! haha, but big thanks for everyone who voted for the james gurney show! and big thanks to james for making sure every contestant gets a free book! thats awsome james, thank you! I'm really going to have to vote for "It begins with a thought." A friend linked me to this andddd... La la la... I have to say I was most impressed with it. Can't quite say the others didn't impress as well. Aaaand... back to writing a paper. I vote for the 3rd one with the Dinosaur attacking the screen. She's taking my class next term and is awesome. I didnt even realize who it was by when I watched it until I saw the sketchbook. Congratulations to all that entered, great work! Damn, that was a hard choice - especially because they are so different in style. But I do have a particularly soft spot for monumental music and ditto catch lines accompanying images of stuff that fly, so "If you can see ..." ended up getting my vote.